Being in the field of education it is very necessary to collaborate with the members of education fraternity to have exchange of views and material. Filnnt comes as an easy solution to this. There are many teachers over Flinnt that contribute a wide variety of material and know how which is essential for a teacher to upgrade. Being on Flinnt, it feels great to be with the Education Community all the time. A teacher can easily share or fetch relevant material pertaining to his or her subject. More over, we also come to know what resources other teachers use to make their pupils learn better and how to use technology to upgrade the learning standards. Flinnt, is not only a sharing and collaboration platform like other social media tools but also is a perfect virtual class room. The institute can register all the students / parents with their mobile number as a class. At Rosary we have created groups like “Std 1 English”, “Std 5 Maths”, “Std 6 General”, “Std 9 SS”, etc. in which we have registered the parents / students as “Learners” and their subject teacher, class teacher and mentors as “Teachers”. The main advantage we got out of this is that teachers could remain in contact with the class even after school hours. We say it as Virtual Class Room as everything remains same as classroom except the need for being physically present.Teacher can share the material, assignments, home work and relevant communication and students can report, submit and reply to the questions of teachers. 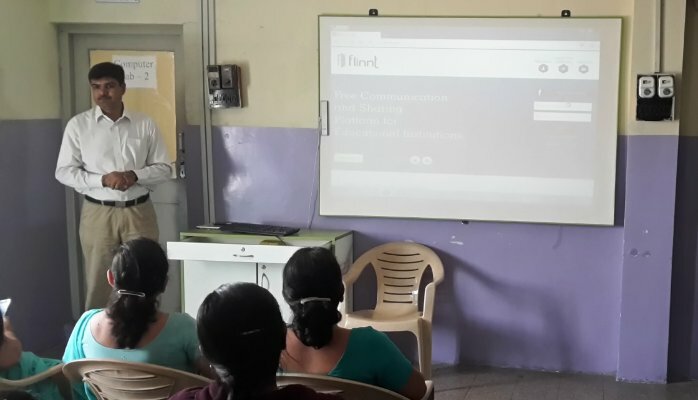 Flinnt is not only a good communication Portal but rather one of best communication solution that we can find for an educational institute. It has seamless facilities of communicating with the audience like Posts, Alerts, Messages, Comments, Likes, etc. Like WhatsApp we can create groups as mentioned in point 2 above and we can easily share images, videos, educational stuff etc. Unlike WhatsApp which does not allow Presentations and Documents to be shared, Flinnt allows us to post such material easily. Moreover, unlike WhatsApp or Facebook where we don’t have control over what the audience will respond or comment, Flinnt has its advantage by controlling or authorizing the comments of learner by a teacher. Since Flinnt uses hierarchical model of communication, the teacher and institutes observes supremacy of control over communication media which is the best advantage so far. Moreover, the users who have registered Flinnt over Web and yet not downloaded the App will receive the updates over SMS and that also without any charge to any party in communication. Such users can then log on to the web and check the updates. Flinnt not only is a good technology but also is very easy to use. Its available on Web and as Android / IOS Platform. Just as one can use Facebook over the web and can share their posts, one can use Flinnt on the web and can share much more than just posts.Flinnt allows us to share presentation ppts, Word and Pdf documents, Audio Files, Video Files and animation. Thus Flinnt has removed the barrier of sharing only images or videos by allowing much more to share. Just as we can use WhatsApp as messenger on the phone, one can use Flinnt App on Android and IOS to get connected to the audience at any time. The Flinnt App allows the same functionality of sharing videos, ppts, docs, etc. as use can by using its web version. Apart from the fact that Flinnt is an Indian made portal, it is none the less than what is available in international market. Flinnt has universal appeal, the user interface is quiet simple and matches with most used application world wide. Since it is on the web, the Institute and the Learners can have the benefit of teachers from different corners of the world. We have Mr. Mathew Matakkad, who is a math teacher and was working with us earlier and is now settled in Australia, as one of the contributors of math material over Flinnt. Students can still have the benefit of his expertise even from distant location. Thus Flinnt is an application that does not have any location barrier. One can be at any place and still be connected with their Students and School. With persistent use of Flinnt and increasing number of parents and learners joining the use of Flinnt we forsee the removal School Handbooks, paper based circulars and many such paper based communication that is easily possible over Flinnt.